Canals, bridges, and the houseboat. Nothing can equal the existence of Zhouzhuang, as the Venice of China. As the city's oldest river in the Bamboo Curtain Country, none of the traveler has ever escaped from its charm. Talk of the town river, which crossed your mind must be City of Venice in Italy. In fact, the Chinese also have a city with the same concept. The many beautiful canals and bridges together with local-style settlement. 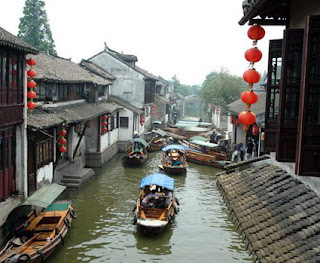 Not surprisingly, Zhouzhuang in Jiangsu Province which is nicknamed her Venice of China. The concept of this kind have been around for hundreds of years ago. The town is first named Yaocheng this could be a stop on Silk Route during the Yuan Dynasty (1860). Small boats carrying silks, ceramics, and a variety of crafts and artwork. All of them gathered here before spread to the rest of southern China. His name was changed to Zhouzhuang in the early Qing Dynasty. Even so, the traditional atmosphere of this city did not change until now. Zhouzhuang is surrounded and divided by the river of the lake as well. There are 14 stone bridges that connect the streets and houses built on water. Just like Venice, the houses in Zhouzhuang were resistant to erosion. The best way to explore Zhouzhuang, is to hire a gondola to get around the canal. Although reasonably priced, do not be surprised if you spend all day driving around town. The owners of the gondola as if deliberately paddled as quietly as possible, until you take in all the atmosphere of this beautiful city. The whole city seemed to compromise to make tourists hypnotized. Who would not gasp see the Hall of Shen's Residence, a royal residence built in 1742. Shen is the count's house occupies a land area of ​​2,000 square meters, divided into three parts. You can see the splendor of this house from the gondola. During the trip, you will be entertained by the friendly local community activities. Children play happily in the courtyard-style houses Suzhou architecture. Occasionally seen too often mothers who wash their clothes. Do not be complacent, because Fu'an Bridge Double Bridge and the beautiful should not be overlooked in the camera lens. You may ask the owner of the gondola to stop in Quanfu Temple. This Buddhist temple has a beautiful building, and not separated from the typical Chinese architecture. 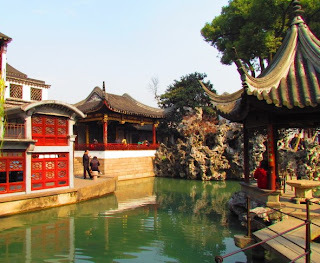 There are also places of worship for the Taoists Chengxu Temple, which is also just as beautiful. The evening is best spent in Nanbai Swing, a lake which lies south of Zhouzhuang. The lake is surrounded by an area of ​​3.6 hectares of Chinese bamboo tree, complete with lotus ponds and a beautiful pavilion in the vicinity. At night, dozens of lanterns hanging from the roof of the houses will emit light and romance. Zhouzhuang show the prettiest face in the fall and winter. However, the city was still smiling sweetly at the two seasons other than that. Not hard to reach this city. You can land at Shanghai Airport and then went on to drive as far as 60 kilometers. Do not forget to capture the moments of the sunset from the gondola, or at sunrise the next day. Zhouzhuang will take you into the painting of nature.